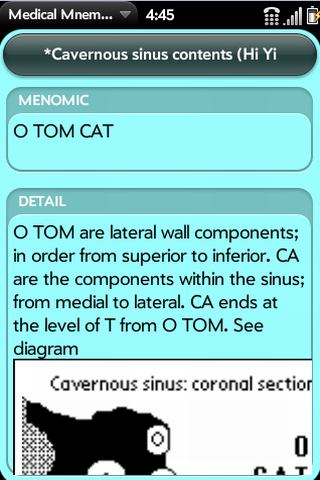 Medical Mnemonics is a Homebrew effort to port the useful mnemonics reference found at http://www.medicalmnemonics.com/. While there is an existing PalmOS version, attempts at contacting the owners/authors of mnemonics.com regarding this webOS version have come to naught. It seems the website is in stasis since contributions have been suspended since 2007. As a result, this is an independent effort to come out with a webOS version which I hope will be useful to students of medicine of all ages. This application will be provided freeware but it is a work in progress. Update version 0.7.0 Categories available: Anatomy Anesthesiology Behavioral Science/Psychology Biology Biochemistry Cardiology Chemistry Dermatology Embryology ENT Epidemiology Emergency medicine Want to see this project progress faster? See the forum thread (see link below) for more details on how YOU can contribute to this project.